The weather started to heat up and there is nothing like having a barbeque outdoors in the evening. This simple salad would make a great accompaniment to grilled meats or chicken. The addition of mint makes this taste sooo fresh! Fry the zucchini slices on a grill pan with some olive oil, seasoning with salt & pepper. Alternately, you can brush them with olive oil, sprinkle with salt & pepper and grill in a hot oven, turning them over when golden. Set aside. Prepare the dressing by mixing all ingredients above. When the zucchini slices are ready, arrange on a platter. Put the drained, diced tomatoes in a bowl and add three quarters of the dressing, mixing everything well. 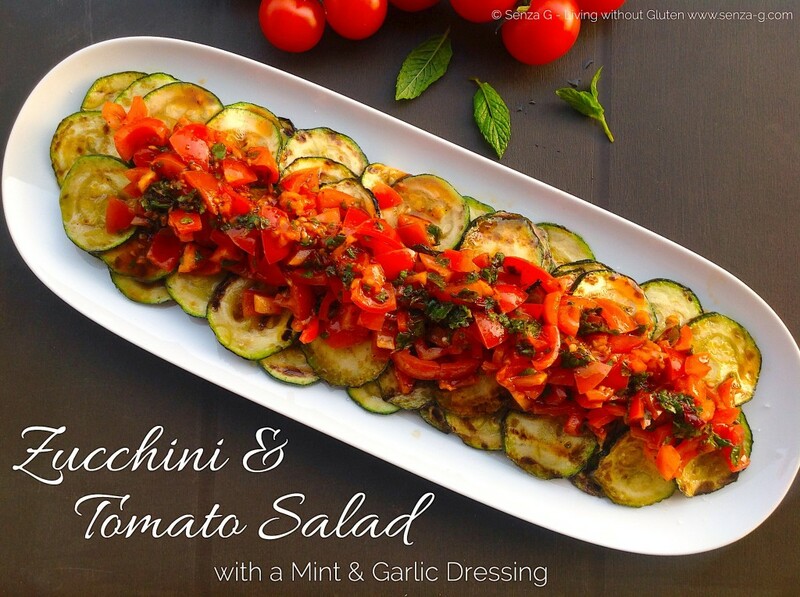 Place the diced tomatoes over the zucchini and drizzle with the remaining dressing.